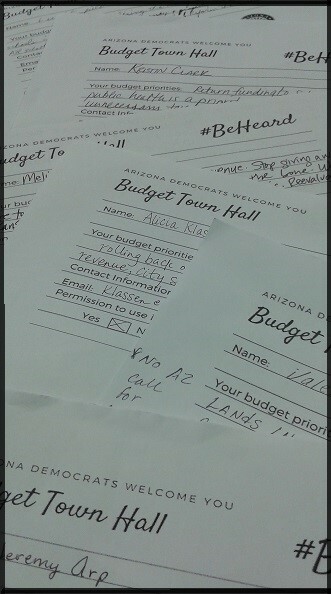 Phoenix-Arizona Democrats have been travelling around the state hosting budget town halls because we want to make sure Arizonans have a chance to #BeHeard. We've collected more than 100 comments from people across the state. Education was clearly on the top of the list of priorities for most, as was tax and private prison reform. 1. Equalizing the money funding all public schools, including tax credit money and property tax money. All Schools must be funded equitably! Reform the formula. 2. Referendum on getting rid of vouchers. 4. 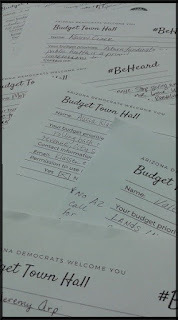 More transparency in government…not less (as Ducey wants)! 1. New sources of revenue. Stop giving away the store to corporations and hacking our budget to the bone. We've seen in Kansas and right here at home how disastrous that is. Reevaluate and remove corporate tax cuts and make them pay their share. Eliminate the automatic 2 percent yearly (Student Tuition Increase): why give my tax dollars to wealthy families to give to private schools when my neighborhood teacher has to purchase her own supplies. WE NEED MORE FUNDING. 2. Answer the market on teacher salaries. Teachers don't need trainings or incentives to get them to stop leaving the state and the profession. They need to be paid what the market demands. 3. End the private, for-profit prison scheme. With more funding we can do what our state so desperately needs: fund education, health care, infrastructure and growth for the future. Return funding to schools. Ensure public health is a priority. Tax corporations and end unnecessary tax breaks for companies who need no incentive to build/locate here. Increase revenues, increase quality of life, increase view of Arizona. 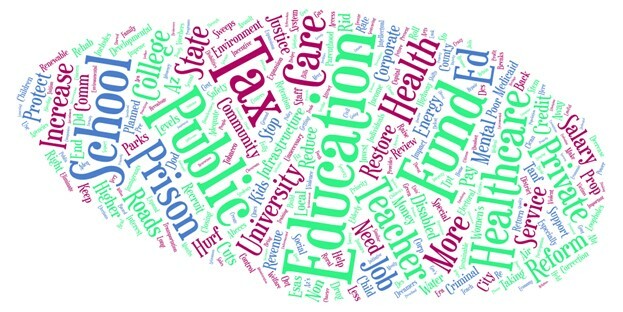 K-12 education, university funding, rolling back or delaying tax cuts to generate more revenue, (protect) city services, no sweeping of HURF funds, no money for private prisons. NOT a fan of Ducey's achievement district. That money should be in public schools – roll back school tax credits. No ESAs (vouchers). If you didn't have a chance to attend a town hall near you, a video of the Flagstaff Town Hall is available by clicking here. Democrats will continue to fight for your priorities at the Capitol. Our vision for Arizona is inclusive, prosperous and fiscally responsible. We remain committed to investing in policies that will improve our quality of life now, while promoting a stronger, more sustainable future. We will keep working for a better Arizona. The Legislature will soon vote on a budget for the state, and we need your voice at the Capitol. Click here to find more ways to #BeHeard.